This past Sunday I competed in the Toronto Women’s Only Half Marathon, an event which Ayesha has already blogged about–capturing the spirit of it perfectly. While three super talented, super lovely ladies (Kat and Jenn and Michelle) and I led the race, Ayesha was leading a Trek Women’s Only Bike Skills Clinic. These two events, happening as they were simultaneously, while over 1000 running women were shouting hurrahs and “Way to gos” at our quartet of a lead pack, through every out and back, I was struck by something spectacular: how important the female athlete is as a cultural force—how through her body and its power, and its articulation of belief, dedication, training, tenacity in and of performance, she embodies the highly generalizable attributes of strength, independence, confidence (to name but a few) so applicable to women at large, BOTH inside and out of sport. In fact, one of the reasons I love Trek so much is their recognition of and support for, female athletes. I realize that with such strong athletes as women like Ayesh, and Emily and Charlotte Batty, it’s not too difficult to get behind them, but still, Trek has done so for a while and continues to do so with aplomb. This weekend’s race marked my third time doing it in as many years as it’s been running. At 4’9” race director Cory Freedman may be my “littlest” dear friend, but her huge personality and boundless energy make her a force to be reckoned with. In the last 3 years, Cory has set an impressive standard for race execution. The races are run flawlessly and with amazing attention to detail. They are a total joyfest. But why a “women’s only” event you might ask? Why would that be a good thing when exclusivity is at odds with the equal treatment among genders many women want? Let me answer that question with a little aside. In 2009 I ran the GoodLife Toronto Half Marathon in a pretty substantial PB. 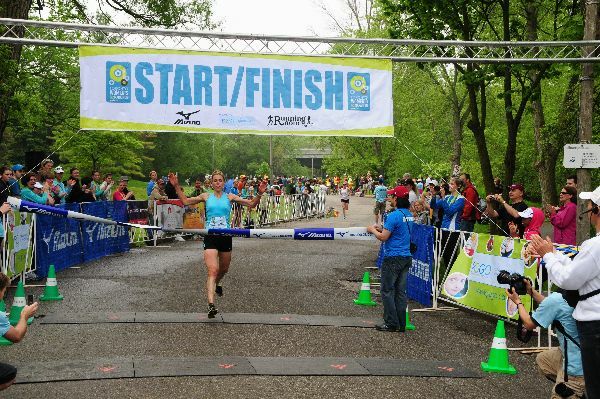 As I was raising my arms to break the “Women’s Winning Tape” across the finish line, a gentleman who clearly didn’t like being “chicked,” sprinted past me to break my tape. It was on the finish line that I realized what I had perceived as subtle clips to my heel throughout the race, and the 3 or 4 corners at which I was cut off ever so slightly, were not so accidental as they may have seemed. This was a profound learning experience for me. Despite the passing of Title IX (of the Education Act of 1972) in the US ,which made gender discrimination illegal and was used to garner equal funding and infrastructure for women in sport, we all know that visibility, respect, and general attention to women’s athletics continues to lag behind men’s sport. 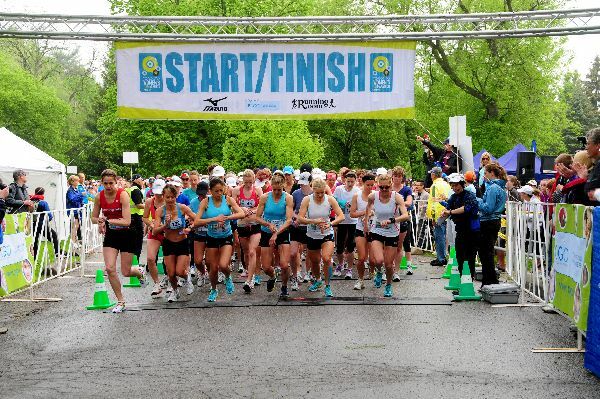 Events such as Toronto’s Women’s Only Races not only makes room for women to assert their beautiful and formidable presence in the world (literally by taking up the most of Sunnybrook park), but in so doing, these events demand attention be paid to the female athlete. Oh, and one more thing…I know this female athlete certainly wants equality and is profoundly aware that the gender gap in performance is closing year after year, but physiological differences are a reality, and so for the time being most female winners follow the winning men. The Women’s Only Race ensure that the winner is ACTUALLY first across the line. Thank you to Cory and to Trek for recognizing what it means to run and ride and swim like a girl.